After some surprising upsets in the first two days of action at the Junior Fed Cup and Junior Davis Cup in San Luis Potosi Mexico, the expected teams advanced to Saturday's semifinals. Junior Davis Cup top seed France, which was shut out by Latvia on Tuesday, earned a spot in the semifinals by beating No. 8 seed China today. Argentina also finished 2-1 in the A Group, but France had a head-to-head win over Argentina on Wednesday and that decides a two-way tie. No. 2 seed Canada lost today to No. 7 seed Australia, but Canada advanced to the semifinals because in a three-way tie (South Africa was also 2-1), head-to-head isn't relevant, and with a 7-2 matches won tally, they beat out Australia and South Africa, who were 5-4. No. 3 seed Japan and No. 4 seed Great Britain did not lose a match in their respective groups, but there is certainly no clear favorite among the four teams remaining. With Australia bowing out today, there will be a new Junior Davis Cup champion on Sunday. Great Britain was runner-up last year. Japan plays France and Great Britain takes on Canada in the semifinals. In the Junior Fed Cup, the fourth-seeded United States girls have been the most impressive team, winning all of their ties by 3-0 scores. They are the only undefeated team in Mexico as of tonight. On Saturday, they will play No. 1 seed China, who got by unseeded Belarus by winning two tiebreakers in the clinching doubles point. No. 3 seed Ukraine squeezed by No. 6 Uzbekistan 2-1, winning the doubles point in three sets. Ukraine's Elina Svitolina, the French Open girls champion, was beaten in her singles match today by Sabina Sharapova, who lost, badly, to Brooke Austin in the first round of the U.S. Open juniors a few weeks ago. Ukraine will play No. 2 seed Russia, the defending Junior Fed Cup champions, who beat Australia 2-1, winning both singles matches. 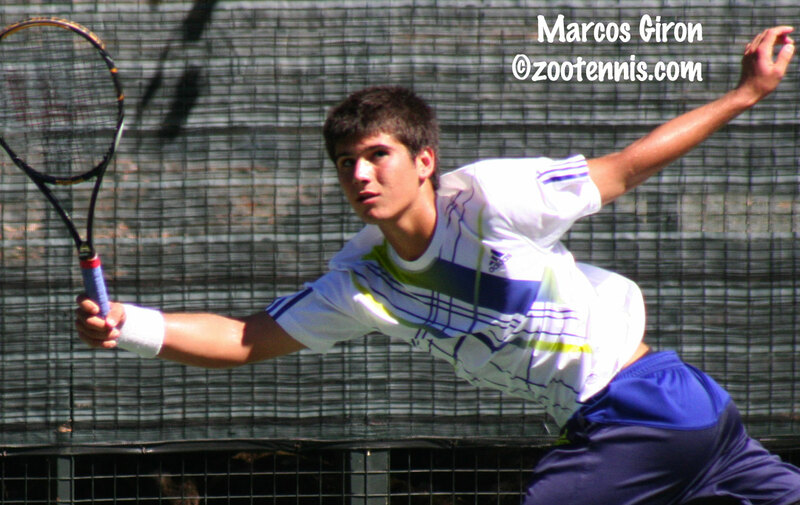 For more on today's action, see the ITF junior website. The prequalifying draws for the ITA Women's Riviera All-American are up at the ITA tournament website. Many of the top freshman in the country are in prequalifying, including Penn's Connie Hsu, Georgia's Lilly Kimbell, Florida's Alex Cercone and Sophie Oyen, USC's Kaitlyn Christian and UCLA's Courtney Dolehide. Speaking of UCLA, in addition to Dolehide, the Bruins have a new player in BYU transfer McCall Jones. The UCLA website has this story explaining why she left Brigham Young and how she ended up at UCLA, which was initially her second choice. The scholarship that Jones took is not spelled out in the story, but Stephanie Hoffpauir, a freshman last season, is not on the roster for this school year. Jones is in the pre-qualifying for doubles and the qualifying for singles of the All-American. In their second match of the Junior Fed Cup in San Luis Potosi Mexico Wednesday, the U.S. girls, seeded fourth, defeated fifth seed Japan, with Kyle McPhillips and Krista Hardebeck taking singles victories. The U.S. will meet unseeded France, also 2-0 after their win over the Czech Republic today, for the Group B top spot and a place in the semifinals. Top seed China will play unseeded Belarus for the top spot in Group A, and in Group D, No. 2 seed Russia and unseeded Australia will decide the top spot. Only Group C, with No. 3 Ukraine playing No. 6 seed Uzbekistan, is complicated, and only then if Ukraine, which is 2-0, should lose to 1-1 Uzbekistan. In the Junior Davis Cup, Group B will be decided between No. 3 Japan and No. 6 Chile. In Group A, all teams are 1-1, including top seed France, so the number of matches and sets won may decide that group. In Group C, the winner between No. 4 seed Great Britain and unseeded India will decide that semifinalist, and in Group D, No. 2 seed Canada is in, if they beat No. 7 seed Australia. If Canada loses to Australia, and South Africa beats Russia, it will get interesting, as three teams would be 2-1. For more on today's action, see the ITF junior website. On the Pro Circuit, the Amelia Island $10,000 event for women hasn't drawn the strongest field, as it going directly up against the $50,000 Lexus of Las Vegas event, but that said, there have been some impressive performances by young players. Fourteen-year-old Taylor Townsend of Jonesboro, Georgia, who was a member of the USA's ITF World 14-and-under Championship team this year, beat 2008 NCAA champion Amanda McDowell in the first round. Fifteen-year-old Jan Abaza of Deerfield Beach, Florida beat No. 2 seed Elizabeth Lumpkin in the first round, and Kate Vialle, Catherine Harrison and Lauren Herring also eliminated seeds in their opening matches. At the $10,000 Futures in Irvine Calif., wild card Marcos Giron won his opening round match against Gilad Ben Zvi of Israel on Tuesday, and today UCLA freshman Dan Kosakowski defeated former Bruin Matt Brooklyn in three sets. Sekou Bangoura Jr., the Florida sophomore, beat USC junior Daniel Nguyen in a third set tiebreaker to advance to the second round. For complete results for all this week's Pro Circuit events, see usta.com. In Tokyo, CoCo Vandeweghe, who turns 19 in December, has advanced to a quarterfinal meeting with world No. 11 Victoria Azarenka of Belarus. A qualifier, Vandeweghe has beaten five top 100 players to advance. For more, see usta.com. There were upsets aplenty today in San Luis Potosí, Mexico, where the first round of the Junior Fed Cup and Junior Davis Cup was completed today. The biggest shock came in the Junior Davis Cup, when top seed France was blanked by unseeded Latvia. Two of the other eight seeds in the Junior Davis Cup were beaten, with No. 5 Czech Republic and No. 8 China losing to India and Argentina respectively. Although No. 3 Japan, No. 4 Great Britain and No. 6 Chile won their matches, they needed to take the doubles point to do so, which indicates that there is a lot of parity among the boys teams. Among the seeds, only No. 2 Canada and No. 7 Australia won both singles matches today. The U.S. boys did not qualify for the Junior Davis Cup this year, losing to Canada in the North American regional. Mexico, as host, receives a wild card into the event. In the Junior Fed Cup, the U.S. girls, seeded No. 4, beat the Czech Republic 3-0, with Grace Min and Krista Hardebeck picking up the two singles points and Min and Kyle McPhillips taking the doubles point. The U.S. team's next match is against No. 5 seed Japan, which was upset by France today 2-1, with France winning both singles points. There was no surprise result among the top 4 seeds, with China (1), Russia (2) and Ukraine (3) advancing, but No. 7 Bolivia and No. 8 Germany both lost, to Australia and Belarus respectively. No. 6 seed Uzbekistan defeated Paraguay. Iron girl Daria Gavrilova heads the Russian Junior Fed Cup team, hoping to lead them to the title for the second straight year. After winning the U.S. Open girls title on the 12th of this month, the world's top-ranked junior went to the Redding $25K, where she reached the quarterfinals, and to last week's $75K in Albuquerque, where she lost in the second round, after beating Michelle Larcher de Brito in the first. Fortunately for her, Albuquerque is also in high altitude (both cities are over a mile high), so her adjustment time for the conditions in Mexico wasn't as short as it may have seemed. 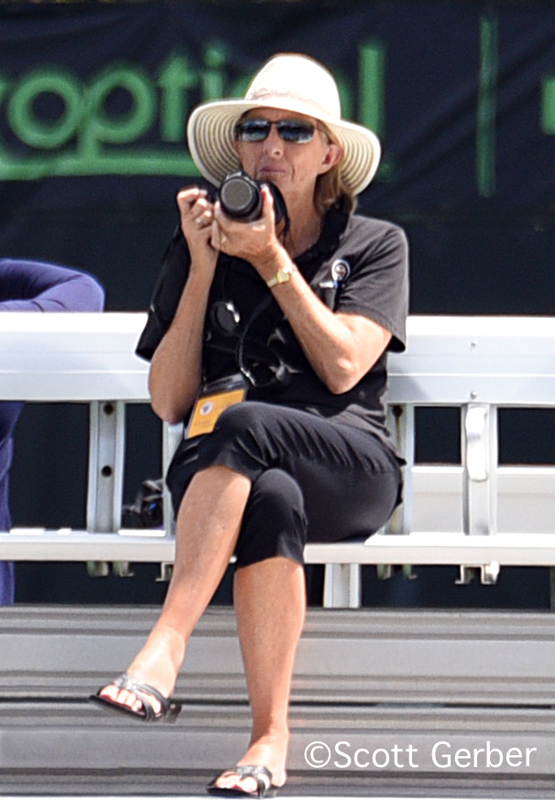 The ITF is covering the tournament in great detail on its website, Susan Mullane is there again as the photographer, and they are doing live streaming of a few matches at this website. The U.S. ITF circuit is in Waco this week, and 13-year-old Julia O'Loughlin has already eliminated the No. 1 seed in second round play today. As is often the case for low-level ITF events (Waco is a Grade 5), there are lots of "upsets", as top local players who do not compete regularly on the circuit often beat those who have accumulated enough points for seeding. There are only three seeded players left in the girls round of 16. Seven of the 16 boys seeds remain, but not No. 1 seed Srikar Alla, who lost to Charles Boyce of Cedar Hill Texas, which is less than 90 miles north of Waco. For complete results, see the TennisLink site. I'm traveling back to Kalamazoo most of the day, after a great weekend at the Land Rover Napa Valley Tennis Classic at Meadowood Resort, so this is just a quick post with a few links. In addition to the Napa event, there were a couple of other major fall events over the weekend for Division I men. The Southern Intercollegiates tournament concludes today in Athens, Georgia, with Bulldog senior Javier Garrapiz in the final of Division I against Georgia Tech's Guillermo Gomez, and Georgia freshman Hernus Pieters playing Vanderbilt's Alex Zotov in the Division II final. For more on the weekend's results, see georgiadogs.com. At the University of Virginia Ranked Plus One Invitational, Cavalier senior Sanam Singh and freshman Alex Domijan won their flights. Top-ranked JP Smith of Tennessee was upset in the first round by Maryland's (and former Baylor player) Maros Horny in A-1 singles, with the flight eventually won by Ivan Salec of Radford. For more on the results, some of which are incomplete due to rain, see virginiasports.com. And check out Tennis Recruiting Network today, which features a conversation with the University of San Diego's men's head coach Brett Masi. Masi offers advice to parents and recruits about what they should look for when in the process of choosing a school. 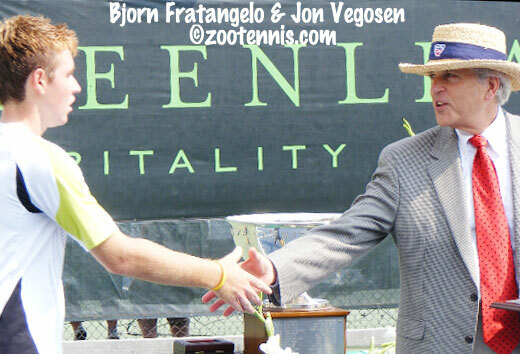 There was a lot of action over the weekend in Pro Circuit tennis as well, from Canada to Mexico as well as the $10,000 Costa Mesa, Calif. and $75,000 Albuquerque, New Mexico events. For all of the results from last week's tournaments, check out this convenient one-page summary from CoreTennis.net. You'll note that Grigor Dimitrov, the 19-year-old Bulgarian of whom much was expected after he won two junior slams in 2008, won another Challenger over the weekend, his third in a row, and has brought his ATP ranking up to 146. Alex Lacroix of Florida is the only player who left the Meadowood Resort without a loss over the three days of competition in the Land Rover Napa Valley Classic. After going 3-0 in his round robin group with a 6-3, 6-1 win over USTA junior Jack Sock Sunday morning, Lacroix advanced with seven other players to the 10-point tiebreaker shootout that concluded the tournament. In rapid succession the senior from France defeated Nick Andrews of Cal 10-3, Alex Musialek of Kentucky 10-6 and in the final, Eric Quigley of Kentucky 10-7. Lacroix has mixed feelings about the format for deciding the Pro Circuit wild card that the USTA has offered to the winner of the event, which prior to this year was reserved strictly for collegiate players, but he appreciated the opportunity it will give him down the road. "It's not really the best one who wins," said Lacroix, who did not lose a set in his three round robin matches prior to the shootout. "I tried not to do mistakes, I won a couple of important points, and did it better, and I won it." 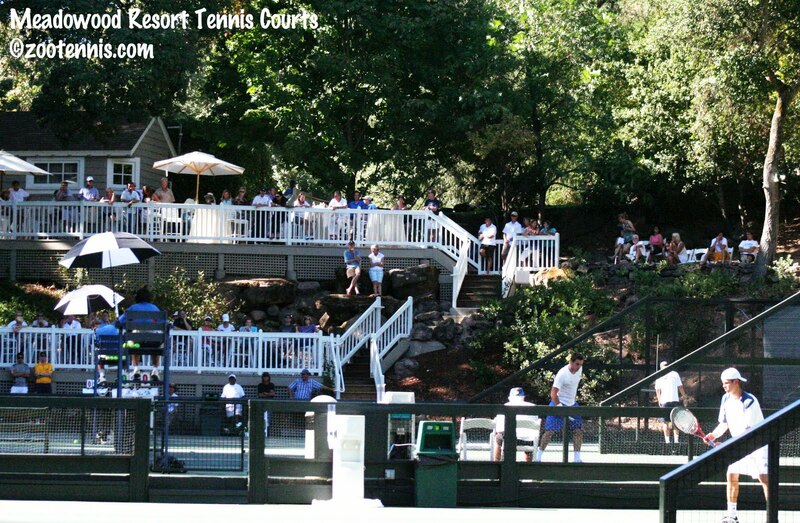 As the crowd built around the deck overlooking court 4, every point took on added significance. Trailing 6-3 in the 10-point tiebreaker against Quigley, Lacroix took the next four points, with a Quigley double fault and a great get by Lacroix helping him change the momentum. At 7-7, Lacroix hit an excellent first serve that Quigley couldn't handle to make it 8-7 and the tiebreaker turned on the next point, surely the "important" point Lacroix referred to in his post-match interview. After a lengthy rally with the two players alternately taking control of the point and relinquishing it, with great offense turning to even better defense, Lacroix found himself at the net. Quigley had his best shot, the forehand, lined up, but his attempt at the pass caught the tape, and Lacroix had his match point. Quigley then missed his first serve, and the second drifted just beyond the service line for a double fault that gave Lacroix the victory. "He's a really good player, and that was just a tiebreaker," the ninth-ranked Lacroix said of his eighth-ranked opponent. "For sure he's one of the Top 10 college players, and I'll see him at the All-American and the National Indoors. He's a really good player and a nice guy, nice to play against." The winners in the eight round robin groups included Lacroix's teammate Sekou Bangoura Jr. of Florida, and Quigley's teammate Alex Musialek of Kentucky, as well as Dennis Nevolo of Illinois, Ed Corrie and Jean Andersen of Texas and Mitchell Frank of the USTA junior team. Due to travel considerations, Corrie and Andersen were unable to participate in the shootout, so the second place finishers in their groups, Nick Andrews of Cal and Alexios Halebian of the USTA, were awarded the spots. Jay Berger, head of men's tennis for the USTA, was pleased with the inaugural event that brought USTA-selected juniors to compete against players from six of the Top 20 teams in 2009-10. "If every college tournament is like this, I might get back into college coaching," joked Berger. "It was a great event for our players to compete against the college kids, and it's something we would like to do every year." Like everyone else associated with the event, Berger was not sure how the juniors would stack up against the college players. "I was real happy with the way they played," Berger said. "I was a little surprised with some of the results, although I was unfamiliar with a lot of the college players and didn't know which numbers they play on their teams. But our kids came to play, and in talking with some of the college coaches, they said their players didn't expect it would be this tough against some of these young juniors. And then there is a lot of pressure for the college players." Lacroix, who was very motivated and focused in his match with Sock, agreed that there was extra anticipation accompanying his contest with the highly-touted junior champion. "People were talking about it yesterday, looking forward to the match," Lacroix said. "We had both won our first two matches, so there was a little bit more pressure in the beginning, but once on the court I didn't feel it and that's why I played good today." Lacroix left impressed with all eight juniors who competed and who won 13 of the 23 matches they played over the tournament's three days. "I knew Jack Sock because he just won the U.S. Open juniors, and the other juniors, watching them play, they're really good," said Lacroix, who was named winner of the Norma Miner outstanding player award. "They're a little bit younger, so maybe we have more experience, but they have beat college players. I was prepared for a Top 10 level college player, and that's why I played good today." After three days of unmatched hospitality, cloudless skies and enthusiastic fans watching the competition between the juniors and collegians, there was unanimous support for a repeat from all involved. "It's one of the nicest tournament's I've ever played in," said 16-year-old Mitchell Krueger, who went 2-1 during weekend play. "I'm glad I was invited and I hope I get invited back. I guess I could be back for the next six years." Mitchell Frank (USTA) def. Abe Souza ( Illinois ), 6-2, ret. The second day at the Land Rover Napa Valley Tennis Classic didn't begin well for the USTA junior contingent, as they lost three of the first four matches to collegians. But the afternoon series of matches all went to the juniors, as Mitchell Frank, Jack Sock, Alexios Halebian and Mitchell Krueger remained undefeated going into the final round robin matches on Sunday. 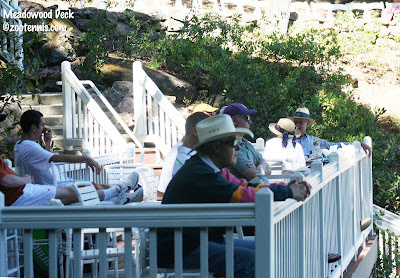 It was an unseasonably warm day in the Napa Valley, although the tree-lined courts at the Meadowood Resort provided welcome shade to the several hundred spectators, many of them Cal-Berkeley fans, who came to watch the some of the best juniors in the United States play top collegians. Bjorn Fratangelo won his first match of the weekend, beating USC freshman Raymond Sarmiento 6-0, 6-3. Back in April, Sarmiento, the top seed, was to play Fratangelo in the first round of the Easter Bowl, but Sarmiento came down with an illness and Fratangelo went on to win the tournament. After a tough three-set loss to Kentucky's Eric Quigley on Friday, Fratangelo showed no signs of fatigue, and played very well against an erratic Sarmiento. Dennis Nevolo of the University of Illinois was prepared and focused against 15-year-old Mackenzie McDonald, who had won his opening match on Friday. McDonald's match was of particular interest to ESPN television commentator Brad Gilbert, who graduated from Piedmont High School, which McDonald now attends, but Gilbert's presence could do nothing to help McDonald in the first five games, all of which went to Nevolo. McDonald made it more competitive in the subsequent games, but lost 6-1, 6-2. "I definitely came prepared," said Nevolo, a junior ranked 26th in the preseason rankings. "Coach told me he had won the day before, so I knew he was going to be a tough competitor, but I didn't know anything about him. He definitely has a mature game for his age. I just overpowered him a little bit, but it's clear in a few years he's going to be a really good player." Many of the spectators who crowded the deck and terrace at Meadowood came to watch Sock, although the majority of them were cheering for his opponent, Cal sophomore Christoffer Konigsfeldt. Konigsfeldt served and volleyed to start, holding his own for the first few games, but Sock gained the upper hand midway through the first set and kept the Cal fans quiet in his 6-4, 6-2 victory. Sock's win sets him up for a round robin final with Florida's Alexandre Lacroix, who defeated Johnny Hamui of Illinois 6-2, 6-2 and is also 2-0. Lacroix is ninth in the ITA preseason rankings. Frank survived a very difficult test against Cal's Pedro Zerbini on Friday, but he had little trouble with Kentucky's Anthony Rossi on Saturday, taking the match by a 6-4, 6-1 score. "Yesterday we had a battle and it was a lot of fun," Frank said. "It's the kind of matches I enjoy and I think everyone who came out enjoyed that match. I thought I played pretty well. Obviously he's a really good player, so it gave me a lot of confidence beating him." "Today fortunately for me, the other guy was in worse shape than me," said Frank, who has struggled with an intestinal illness during the training prior to the tournament. "I've been a little lethargic out there, but you're not going to be able to play every match at 100 percent." Halebian went to 2-0 with a routine 6-3, 6-2 win over Nassim Slilam of Florida, while Krueger's 6-3, 7-6(4) win over David Holiner of Texas was a tough one, especially late in the second set. The last five games were long and filled with breaks, but the 16-year-old Krueger managed to squeak by. "At the end of the second, we were kind of trading breaks, and I had a match point at 4-5, but he hit a big serve and I could barely get a racquet on it," said Krueger. "The second set was really close; the first set I was dictating pretty well and I won it pretty easily, but in the second set he definitely picked it up and we were having a lot better points and longer rallies." Holiner served for the second set, but was broken and Krueger got up in the tiebreak and held on. After his disappointing debut in New York, where as a wild card he lost in the first round to Tiago Fernandes of Brazil 6-0, 6-1, Krueger was pleased to have rebounded quickly. "Coming in, I didn't know what to expect, especially after U.S. Open, but I'm playing well," Krueger said. "I can see how I stand up to these guys now. We're pretty close; not that far off." Krueger will play Sekou Bangoura Jr. of Florida in his group on Sunday. The winner of that match will go on to the tiebreak shootout that will decide the overall winner of the tournament. For additional coverage of the Napa Valley Classic, see Steve Pratt's articles at usta.com. If the 24 college players at the Land Rover Napa Valley Classic weren't taking the USTA juniors seriously prior to the opening round robin matches Friday, they will on Saturday, after the juniors went 6-2 against players from Cal-Berkeley, USC, Illinois, Kentucky, and Texas. Florida, the other college team playing at the Meadowood resort, did not have any matches against juniors. Mitchell Krueger, the 16-year-old from Texas, recorded the first win for the USTA players when he defeated University of Southern California senior Jaak Poldma 7-6(3), 6-2. He was soon followed by Marcos Giron, who also took out his opponent in straight sets, defeating Vasko Mladenov of the University of Texas 6-3, 6-4. Giron admitted that playing against older, more experienced players comes with some advantages. "I feel less pressure because these guys want to win and they don't really want to lose to guys who are so much younger than them," said Giron, a 17-year-old from Thousand Oaks, Calif. "But this is only one match, so we'll have to see how I do in the rest of the tournament." Mitchell Frank scored a 6-2, 6-7(3), 7-5 win over 17th-ranked Pedro Zerbini of Cal, when Zerbini cramped and having already received the sole medical timeout he is allowed, could not receive treatment. Serving at deuce at 5-6, Zerbini was given a point penalty for a time violation, and he could barely move on the subsequent match point. Although it was in the upper 80s and sunny all day, there was no humidity, and Frank was still energetically bouncing around as the match ended nearly three hours after it had begun. 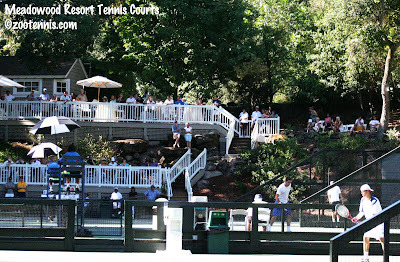 The youngest player on the Meadowood courts, 15-year-old Mackenzie McDonald, agreed with Giron that the pressure was all on his opponent, Maks Gold of Kentucky. Gold, a late replacement for the Wildcats, who had originally planned to bring Brad Cox and Alberto Gonzales, is a freshman, so his advantage over McDonald was not as great. Gold also had trouble keeping balls in play, according to McDonald. "I played all right," said McDonald, who lives about 90 minutes from Napa in Piedmont, Calif. "I'm working on my serve now, so it's getting better. From the ground I was pretty good, but my opponent just made too many errors today." Perhaps the least surprising junior winner on Friday was USTA 18s champion and U.S. Open boys champion Jack Sock, who beat Illinois senior Johnny Hamui 6-4, 6-3. But Sock, who arrived late Thursday evening, said he had been concentrating more on catching up on school work than on tennis since returning from New York. "I didn't really play much at all last week, doing a lot of schoolwork and resting the body. It's been a long summer for me," Sock said. "I could have served a lot better today, definitely, but overall I think I played pretty solid." Sock broke Hamui at 4-5 in the opening set, seizing his first opportunity at 30-40. In the second set, after a couple of sloppy errors, he hit two consecutive forehands so hard the several dozen spectators watching from the observation deck gasped. Hamui somehow got the first one back, but he had no chance on the second. After taking a 4-1 lead, Sock let Hamui back on serve, but broke Hamui at 3-4 by using the drop shot/lob combination several times. Sock then held to give himself a welcome 18th birthday gift. "I'm glad I won. You can't ask for a better site, you can't ask for a better day. It was really nice out. It's really fun having these guys here...I get to know them a little bit better, playing on the team is pretty fun." Alexios Halebian rounded out the USTA junior wins, taking a 6-7(5), 7-6(3), 6-4 decision from USC's Daniel Nguyen. Nguyen had a chance to go up 5-1 in the second set, but couldn't take it, with Halebian fighting back to level the match. Halebian then took a two-break lead in the third set, but Nguyen came back to force Halebian to serve for it at 5-4. It was a struggle, but some good serving in the final game gave the 16-year-old from Glendale, Calif. the win. "I was a little nervous," Halebian admitted of that final game. "I had my chances, should have held a little easier. At 30-love I had an easy forehand and I missed it, and I got a little nervous but it was a good ending. It was a good match." Halebian was happy that his USTA team got off to a good start. "I hope we can keep it up. I hope tomorrow we can go 7 for 8." 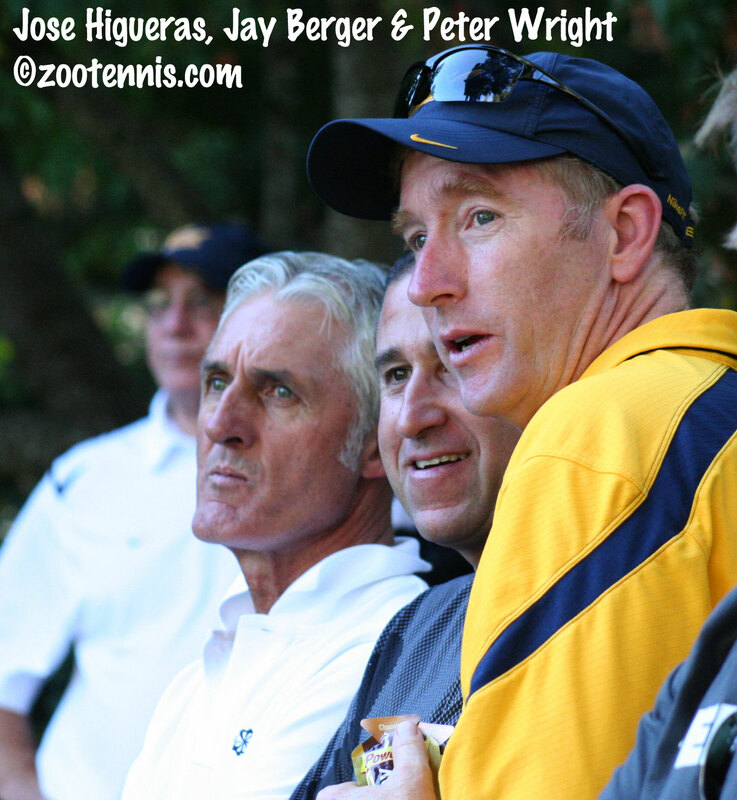 Cal-Berkeley coach Peter Wright, who has hosted the event for ten years, but invited juniors to compete for the first time this year, was impressed by the juniors' performance on the opening day. Alexios Halebian (USTA) def. Daniel Nguyen (USC) 6-7(5), 7-6(3), 6-4. For more on the tournament, see Steve Pratt's articles and photos for usta.com. I've arrived in Napa Valley for the tournament, as have most of the players from the six teams: USC, Florida, Cal-Berkeley, Kentucky, Texas and Illinois, as well as the 8 USTA juniors who will be competing. Also here are the USTA head of coaching Jose Higueras, head of men's tennis Jay Berger, who returned from Davis Cup in Bogota, Colombia earlier this week and Erica Perkins and Ricardo Acuna, who have been conducting a camp with seven of the juniors this week at the Regional Training Center at Eagle-Fustar Academy (Jack Sock is not arriving until this evening). The setting is indeed beautiful and peaceful--it's a perfect antidote to the chaos and buzz of New York. The draw is here (you may need to have excel to download and open it) and the order of play for Friday is here. The AT&T reception here isn't great, but there is working wi-fi, so I hope to tweet some results Friday. 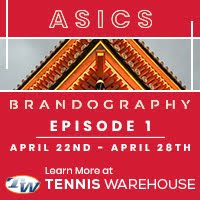 Also, Ken Thomas of radiotennis.com will be here webcasting, so log on to his site to listen to his play-by-play of the matches, it's free. 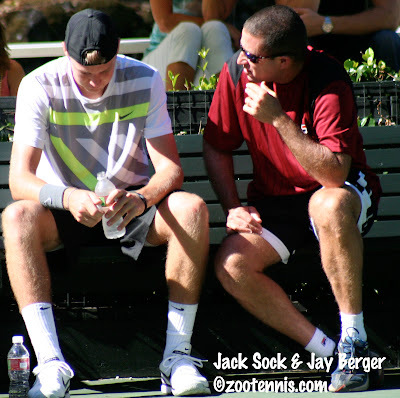 My Tennis Recruiting Network column this week is a profile of Jack Sock, the USTA National 18s and U.S. Open boys champion. At the time of our conversation in New York, Sock had nearly a dozen colleges on his list, but in the next few weeks he will be paring that down to a manageable number. 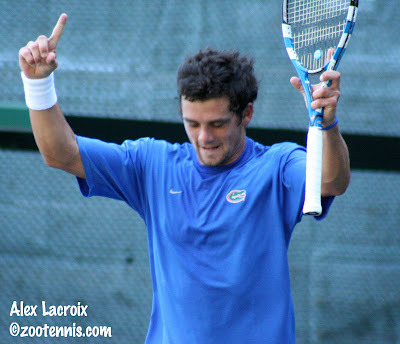 When Ryan Sweeting won the U.S. Open boys title in 2005, he had already verbally committed to Florida for the spring term, and in 2008, finalist Devin Britton was preparing to enter Ole Miss in January of 2009. Chase Buchanan, the 2009 finalist, was already enrolled at Ohio State. So I think Sock is the first U.S. Open boys champion or finalist in the past dozen years who is still undecided when it comes to college. It will be interesting to see him on the court against current Division I college players this weekend in Napa, although he has of course played college players often when competing in the Pro Circuit Futures. So if you have ideas, take him up on it. For the complete release, see usta.com. I'd heard many great things about the Land Rover Napa Valley Classic, which is hosted by Cal-Berkeley men's head coach Peter Wright every September. Coaches who had participated spoke glowingly about the venue and the atmosphere, which, although low-key, is given added significance by the wine harvest. This year, I heard at Kalamazoo that juniors were going to be a part of the tournament for the first time, and because the event was scheduled for this coming weekend, I had enough time between it and the U.S. Open to add it to my live coverage calendar. FLUSHING, N.Y., September 21, 2010 – The USTA announced today that US Open boys’ champion Jack Sock will join seven of the nation’s top juniors in a unique tournament format playing against some of the country’s top collegiate players in the Land Rover Napa Valley Tennis Classic, September 24-26. The round-robin event, which will take place at Meadowood Napa Valley in St. Helena, Calif., features four players from six NCAA Division I schools including the University of California, Berkeley, the University of Florida, the University of Illinois, the University of Kentucky, the University of Texas and the University of Southern California. After Napa, I will be making my annual trip to Tulsa for the D'Novo All-American, which is immediately followed by the ITF Grade B1 Pan-American Closed Oct. 11-17. The boys acceptances are led by Dennis Novikov, Bjorn Fratangelo, Shane Vinsant and Mitchell Krueger, all in the ITF Top 100. Lauren Davis, at 16, is the highest ranked player in the girls field, which features eight Top 100 players, including last year's finalists Eugenie Bouchard of Canada and Ester Goldfeld of the U.S. 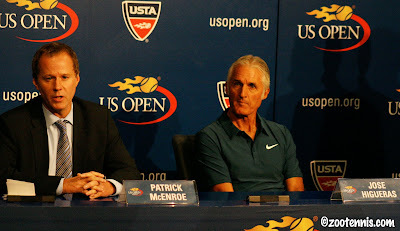 It's been a couple of weeks since Patrick McEnroe and Jose Higueras held a press conference at the U.S. Open to discuss USTA Player Development, and in the past few days, I've had an opportunity to review the transcript and the material that was distributed. The biggest news that came out of that press conference, of course, was McEnroe's decision to step down as Davis Cup captain after this past weekend's tie with Colombia, but player development still received most of the attention. The complete transcript is available here. I've been following player development closely for the past five or six years, and not just U.S. player development. Although hampered by my monolingualism, I try to keep up with what is happening on that front around the world, and I am increasingly convinced that players like Rafael Nadal and Roger Federer, the Williams sisters and other multi-slam champions have little relation to their federation's philosophy or checkbook. But if you believe that federations have a role to play in promoting the game at the grass roots level and giving promising players a structure in which to develop, the conversation on how that is progressing seems a valid one. As I mentioned over a year ago, I think Patrick McEnroe and Jose Higueras are on the right track. The Regional Training Centers have been a great innovation, and to have a dozen of them already in place, with more to come, suggests that the much-derided USTA bureaucracy is not all that formidable when a politically adept leader knows what he wants. An example of the positive impact an RTC can have was demonstrated this summer with Robin Anderson. Rather than require that Anderson work in Boca or Carson, the USTA provided the funding for her to train this summer at the RTC in College Park, Maryland, which is closer to her home, and where she can live with relatives. Joining her at College Park is Alex Vuckovic, a former Princeton player, who has worked with her the past year. The USTA's emphasis on developing working relationships with private academies and coaches has been mentioned frequently in the past two years, and most of the coaches I've spoken with have seen improvements in communication, although most would like to see even more interaction. Perhaps McEnroe's resignation from the Davis Cup captaincy, which he framed as a decision based on family and on more time to devote to player development, will result in more face-to-face discussions with coaches about the USTA's coaching philosophy and direction. It's fair to ask whether John Isner is primarily responsible for this increased attention to college tennis, but as a former college star who can recognize the increased physicality and maturity demanded on the tour now, McEnroe has to be given credit for seeing the advantages of the college route. In fact, the one-page graphic in the material distributed at the Open, which is entitled The American Pathway, put it very simply: QuickStart Tennis-> Junior Competition-> Collegiate Varsity Competition->Professional Tennis. The increased emphasis on clay has been much discussed, but it's clear that McEnroe is not interested in clay per se, but in the opportunities it provides to hone skills that will work on all surfaces. The downside of clay courts is of course, the expense of maintaining them, and that underlying cost will mean most parks and clubs will be setting up QuickStart on hard courts, not clay, or for the purist, Har-Tru. The commitment to earning wild cards is another trend I'm in favor of, and I think deciding a U.S. Open, French and Australian main draw wild card this way is appropriate. But tournaments cost money, which means this is a more expensive way of determining a wild card. And that brings me to a final point. For many years, there were major complaints about the lack of money the USTA devoted specifically to Player Development. Before McEnroe was hired, in April of 2008, the decision was made to fund the Boca Raton academy, and since that time there have been many complaints that the USTA is spending too much money on player development, or at least too much money on a few select players. (For more along those lines, see Charlie Bricker's article on World Tennis). These are valid concerns, and asset allocation is always a topic for debate, whether it's a household, a business, a school, a non-profit or a government. I would prefer to see tournament fees reduced, or more money dedicated to officiating or more subsidized travel/housing at tournaments, which would benefit more players, not just a select few. And I believe the Boca experiment, while done with the best of intentions, probably wasn't an initiative that could ever produce a viable return on investment. Player Development needed a permanent home, and housing for camps, but the RTC format makes infinitely more sense to me. I speak to parents who are still unsure of the USTA's direction and motives. While you may argue that its philosophy is wrong or its implementation is faulty or its money is wasted, I don't understand those who question their motives. Don't we all want more great American tennis players? (Maybe not, Bill Dwyer of the Los Angeles Times thinks that's all overblown.) Don't we love the sport and want to see it thrive in this country and the world? If we could start in agreement on that, future conversations on player development might lead to more productive exchanges. 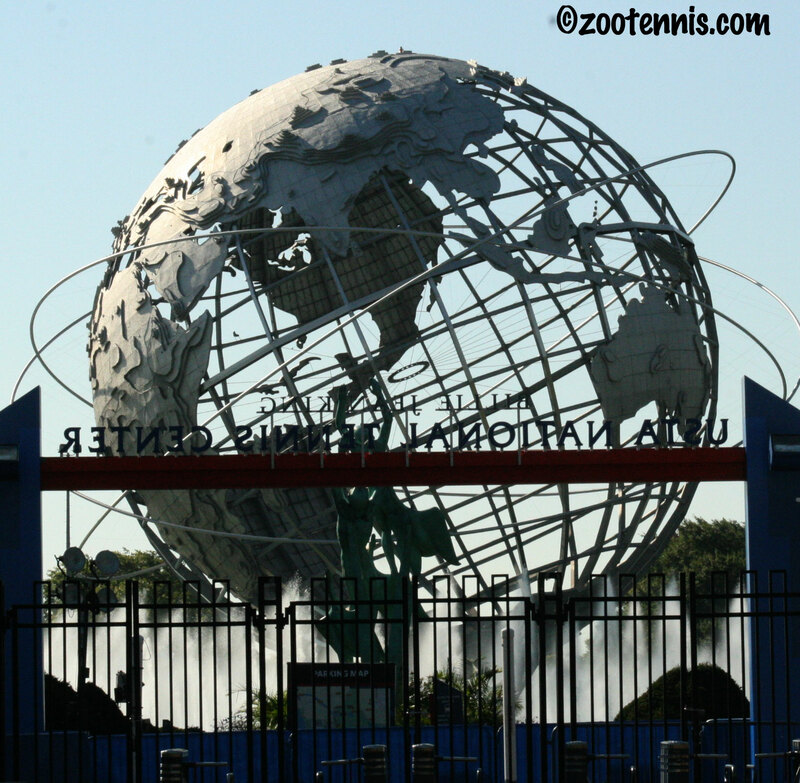 Last month the USTA announced changes for the 2011 National Junior schedule. At one point, consideration was being given to dropping the Spring Nationals and turning the Winter Nationals into an indoor event, but the final set of changes approved by the Junior Competition committee did not include anything as dramatic as that. National Open draw size is being reduced from 64 to 32, shortened to three days in length, and only the finalists are assured entry into the subsequent National Championship. The Regional Level 3s are limited to four specified dates throughout the year. The 14s Nationals will join the 12s as compass draws, and the 14s clays and hard courts will be 128 draws, not 192. Going to a 128 draw with a qualifier has long been a wish of mine for Kalamazoo, but the Clays and the Hard Courts remain 192-draws for 16s and 18s. The Interscholastic 18s championships have been eliminated. I've never been sold on the National Open concept and have attended very few of them, but I do wonder if it would be worthwhile, that is, economically feasible, to host a National Open for just one age group with such a small number of fee-paying participants. There aren't many economies of scale with 32 players total. I assume the philosophy behind this change is to have juniors play more in their districts and sections and travel less, thereby reducing the cost. It also seems more accommodating to those who have chosen to remain in regular school. But the true ramifications of the changes probably won't be known for several years, and unintended consequences have a way of altering the best of intentions. For the complete list of the changes for 2011, see usta.com. Today was a very exciting day in Davis Cup. The United States avoided relegation from the World Group thanks to Mardy Fish, who defeated Santiago Giraldo of Colombia 3-6, 6-3, 7-5, 4-6, 8-6 in Bogota, to give the U.S. a 3-1 win. Fish was involved in winning all three points, taking the opening rubber on Friday and teaming with John Isner yesterday to take the doubles point from former USC all-American Robert Farah and Carlos Salamanca in four sets. For more on the tie, Patrick McEnroe's last as Captain, see daviscup.com. Ryan Harrison was expected to play the dead rubber, but due to rain, it was cancelled. France waltzed to December's Davis Cup final with a 5-0 win over Argentina, but their opponent wasn't known until the fifth rubber between Serbia and the Czech Republic. Trailing 2-1 after losing the doubles Saturday, Novak Djokovic and Janko Tipsarevic put Serbia in the final with singles victories today. France will travel to Serbia to decide the 2011 Davis Cup. In another exciting match, India came back from 2-0 down at home to defeat Brazil and retain its place in the World Group. Rohan Bopanna was the hero, taking the fifth rubber over Ricardo Mello after former Virginia Cavalier Somdev Devvarman had beaten Thomas Bellucci, 7-6(3), 4-0 ret. to even the tie at 2. Bopanna, who reached the U.S. Open men's doubles final last week, is barely in the top 500 in singles, but his 6-3, 7-6(2,) 6-3 win over 75th-ranked Mello indicates just how inspirational Davis Cup competition can be. The Kentucky ITF tournament, now a Grade 4, finished today with a pair of Americans claiming their first ITF junior titles. Fourteen-year-old Brooke Austin, the No. 11 seed, beat unseeded Hannah King 6-2, 6-2 in the girls final, and 16-year-old Anthony Delcore, the No. 16 seed, defeated unseeded Sean Karl 6-2, 7-5. Austin and Delcore also reached the doubles finals, with Austin and Josie Kulhman falling to No. 4 seeds Meghan Blevins and Catherine Harrison 6-2, 6-4, and Delcore and Austin Smith, the fifth seeds, losing to unseeded Thai Kwiatkowski and Nicholas Naumann 6-2, 6-2. For the complete draws, see the ITF junior website. 2009 NCAA champion Devin Britton has struggled putting together wins since he turned pro last summer, but he has reached his first Futures final with a win today in the Claremont, Calif. Futures. The unseeded Britton, who has not lost a set in his four wins this week, will play qualifier Gary Sacks, the former USC Trojan, in Sunday's final. It could be a good match, with their last encounter, in the Brownsville Futures tournament in February, going to Britton by a score of 6-7(6), 7-5, 7-6(5). For more on Britton's semifinal win over Karunuday Singh, click here. In the Tulsa Challenger, two former college players will meet for the title of the $50,000 event. Lester Cook, who played at Texas A & M, will meet former Vanderbilt star Bobby Reynolds in Sunday's final. Cook, the No. 7 seed defeated unseeded Andrew Anderson of South Africa 6-2, 3-0 ret., while the unseeded Reynolds blanked No. 6 seed Tim Smyczek 6-0, 6-0 in today's semifinals. The final in the women's $25,000 challenger in Redding features former ITA Small College champion Jelena Pandzic of Croatia against top seed Jamie Hampton of the U.S. Pandzic, who is unseeded, took out U.S. Open girls champion Daria Gavrilova of Russia in the quarterfinals. Christina McHale reached her first WTA semifinal with a win over Alexa Glatch yesterday, but was unable to make the Quebec City final, dropping a 6-2, 6-2 decision to qualifier Tamira Paszek of Austria today. Paszek will face American Bethanie Mattek-Sands in Sunday's final. For complete draws, see the WTA website. And although there has not been an official release yet by the USTA, I heard while in New York that the Junior Fed Cup team that will compete in world championships in Mexico later this month is comprised of Krista Hardebeck, Grace Min and Kyle McPhillips. The boys Junior Davis Cup team will not be participating this year, after losing to Canada in North American qualifying. New York is a place of constant distractions, many of them welcome. You never quite know who you'll run into around the outer courts, in the media center or in the seemingly endless corridors underneath Ashe. This is a preface to my recap of the U.S. Open Junior championships for the Tennis Recruiting Network, which is not my traditional narrative, but rather a dozen items about the tournament this year. If you think Jack Sock, the first U.S. boys champion in a decade, isn't given his due, don't worry; I'm writing a recruiting profile on him next week. The photographs in the slideshow below are all the work of my husband, Paul Ballard. I truly appreciate his efforts all week and am grateful that I have a photo of every junior player who participated in the Open this year thanks to him. There is no YouTube video from this tournament, because the USTA prohibits anyone but their rights holders from taking video of actual competition. Stephen Kelly contacted me about using a zootennis photo of Jack Sock for a post he did on former grand slam boys champions for his blog A Tough Crowd. I'm happy he did, because it alerted me to his research. Kelly looks at the boys who have won junior slams from 1995-2004, which may be a small sample, but at least it is far enough in the past to have given most of the players time to mature. I also found it interesting that the U.S. Open is, again in this small sample, the slam that best indicates success on the pro tour. Before Sock won the U.S. Open boys title, Donald Young was the last U.S. boy to win a junior slam, at Wimbledon, in 2007. Greg Couch of AOL Fanhouse, who previously worked at the Chicago Sun-Times, has been following Young's career since he was a teenage prodigy in Chicago. Now 21, Young seems have stalled around the 100 mark in his ATP rankings climb, and in New York, Couch talked to Young's parents about the uneasy relations between them and the USTA. Like Young's agent, I was surprised by the passages in Patrick McEnroe's recent book Hardcourt Confidential: Tales from Twenty Years in the Pro Tennis Trenches that laid the blame directly at the feet of Young's parents. I do think Couch is right in saying that John McEnroe played a major role in raising expectations that Young could not fulfill at age 16 or 17. For Couch's complete column, click here. Lagardere announced today that it had signed USTA girls 18s champion Shelby Rogers. Rogers had turned pro earlier this year. For an exploration on the process of identifying and signing young players, see this Joe Drape story from the New York Times. Robin Anderson has not yet decided whether her tennis path will include college, according to this feature from the Newark Star-Ledger. As the top recruit in her class, according to Tennis Recruiting Network, Anderson would have her choice of colleges, so I'm certain it's not a decision that she and her family will take lightly. I don't believe I've posted a link to the ITA preseason rankings, which now include a new set of rankings for freshmen. NCAA finalist Jana Jurikova of Cal-Berkeley is No. 1 in the women's rankings, followed by Hilary Barte of Stanford, Maria Sanchez of Southern Cal, and Lauren Embree and Allie Will of Florida. Kristie Ahn of Stanford is the top-rated freshman. JP Smith of Tennessee occupies the top spot in the men's rankings, followed by Henrique Cunha of Duke, NCAA champion Bradley Klahn of Stanford, Guillermo Gomez of Georgia Tech, and Chase Buchanan of Ohio State. Alex Domijan of Virginia is the top-rated freshman. For those of you who missed the tweet, Buchanan is in Colombia as a hitting partner for the U.S. Davis Cup team. The top women's doubles team is Mari Andersson and Jurikova of Cal, while Cunha and Reid Carleton are the top-ranked men's doubles team. The qualifying tournament at the U.S. Open juniors is one place where the density of college coaches is even greater than at the USTA Nationals, primarily because there are men's and women's coaches gathered in the same place. Two of the newest Division I head coaches were there: David Roditi, the former USTA National coach who returns to his alma mater at TCU, and former Akron coach Jeff Wyshner, who takes over the Wake Forest women's head coaching job. . In the Ivy League, Division III Middlebury men's coach Dave Schwarz has accepted the head coaching position at Brown. In the MAC, Georgia Tech women's assistant Anca Dumitrescu has been named head women's coach at Miami(Ohio). With Dumitrescu's departure, former Georgia Tech player Alison Silverio Witsken has taken the assistant's position at her alma mater. It has not yet been announced by Ohio State, but Justin Kronauge, who completed his eligibility this spring, will take the assistant's position for Ty Tucker's team. And speaking of assistants, North Carolina men's assistant Tripp Phillips was the subject of this video feature from the New York Times, which examines what it is the college coaches are looking for when they watch a recruit. Finally, here is the New York Times Karen Crouse's excellent story on the current trend toward college for U.S. juniors. On Sunday, I had an opportunity to talk with Dave "The Koz" Kozlowski for a few minutes about the US Open junior championships. That short interview is now available at Tennis Ledger. And for those of you who don't read Peter Bodo's TennisWorld blog regularly, I should point out that on Sunday, he posted on the US Open boys final between Jack Sock and Denis Kudla. The visit to the White House is the pinnacle of an NCAA athlete's career, because it means he or she has won a national championship. 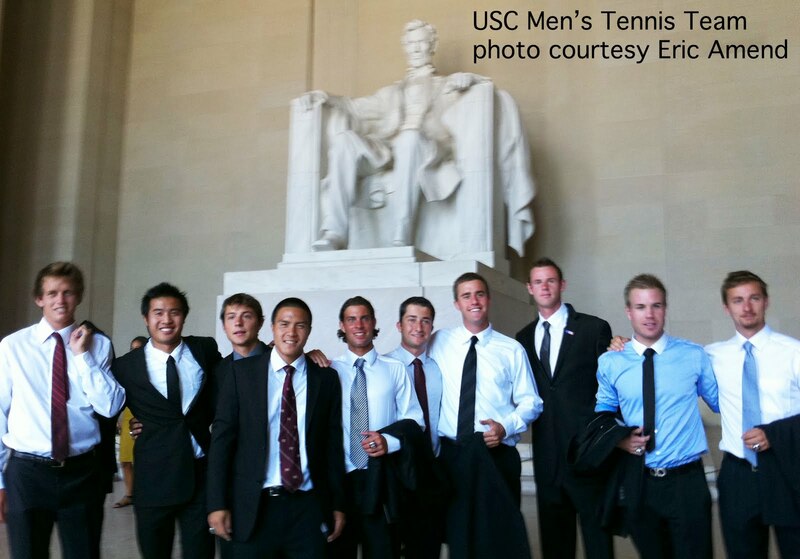 The Stanford women's tennis team and the University of Southern California men's tennis team were in Washington DC yesterday to be honored by President Obama. The Pro Circuit is back, after a hiatus of several weeks due to the US Open. There is a $25,000 women's event in Redding Calif., which has both US Open girls finalists in the field. Daria Gavrilova of Russia is playing on a junior exemption and will meet qualifier Whitney Jones in the first round. Yulia Putintseva received entry via a special exemption and has drawn top seed Jamie Hampton in the first round. There is a men's $50,000 challenger in Tulsa, which has already lost No. 2 seed Donald Young, who was beaten by wild card Blake Strode 6-3, 7-6(4) in the opening round. Top seed Taylor Dent is facing qualifier Oleksandr Nedovyesov, the former Oklahoma State all-American, in the opening round. This week Claremont hosts the first of three men's $10,000 events in California. Wild card Dan Kosakowski won his opening match today, as did former college players Devin Britton, Dimitar Kutrovsky and Conor Pollock. 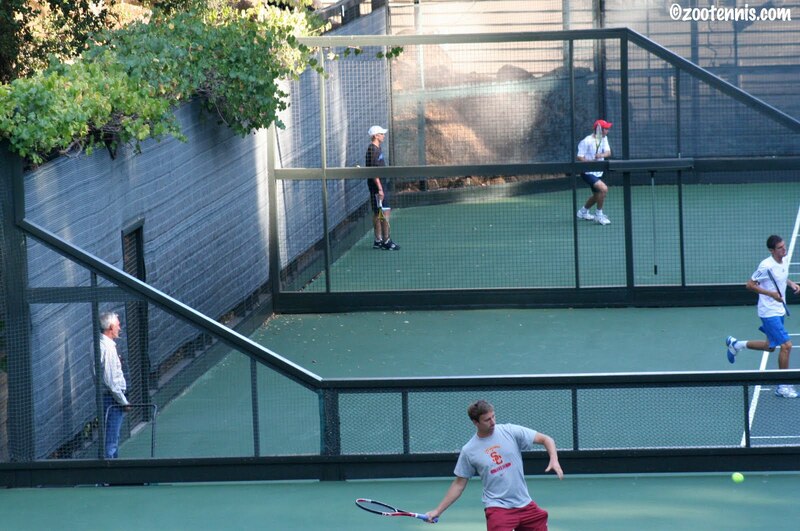 USC junior Steve Johnson, the No. 8 seed, will play Stanford junior Ryan Thacher, a qualifier, in a first round match Wednesday. For complete draws for all three tournaments, see the Pro Circuit page at usta.com. In the past, many juniors, both international and American, have gone from the US Open to the Grade 1 in Lexington Kentucky. But this year, with the tournament dropping to a Grade 4, the participation has fallen. This is part of a disturbing trend that is basically financial in nature. ITF Grade 1, 2, and 3 tournaments are prohibited from providing private housing for junior players, and the tournaments can not afford the alternative, which is paying for the players to stay in hotels, As a result, they have all elected to become Grade 4s, which aren't required to provide housing. This has led to the virtual elimination of higher level ITF tournaments in the U.S., with only Carson, Easter Bowl, US Open, Tulsa, Eddie Herr and Orange Bowl providing the opportunity for substantial ITF points without leaving the country. The Hard Courts in New Jersey and the Grade 2 in Columbia/Lexington South Carolina have joined the Grass Courts in moving down. For the draws for this week's Kentucky tournament, see the ITF junior website. We're heading back to Kalamazoo this evening, after lunch with Radio Wimbledon and Eurosports commentator Guy McCrea and a tour of the New York Times building to meet the faces behind the Straight Sets blog I have been contributing to for several years. As always at the U.S. Open, it's been a long nine days, with more matches than I can possibly see. But it's been a very satisfying tournament from my perspective, with the strong performances by the American boys especially noteworthy. Here are some of the other U.S. Open junior championships stories that appeared in other outlets. I'll try to put together the slideshow later this week, once I've had an opportunity to review the thousands of pictures now in my library from this one tournament. Karen Crouse of the New York Times wrote this piece on the Jack Sock - Denis Kudla boys final. Liz Clarke of the Washington Post focused on the local D.C. angle in her story, which can found here. Josh Rey, who wrote throughout the tournament for usopen.org, did his usual outstanding job when he was assigned to cover the boys final yesterday. For his piece, click here. Nicholas Spangler did the girls championship report for usopen.org, that post can be found here. There is also a series of daily video junior reports at usopen.org. College tennis is gearing up again, with the first majors of the season, the All-American tournaments, scheduled for next month. The ITA has announced the participants in the men's D'Novo in Tulsa, which I'll be covering, and the women's Riviera in Pacific Palisades. 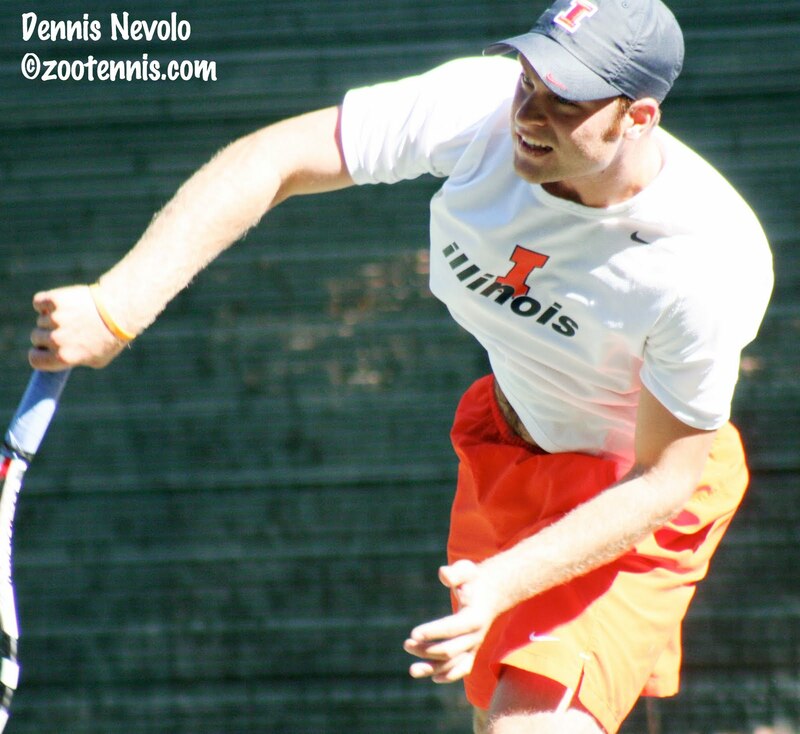 Alex Domijan of Virginia received the ITA wild card, and he's one of five Cavaliers in the 64-player field. Ten years ago another Nebraska Cornhusker fan came to the U.S. Open Junior Championships and left with the boys singles title. On a cool and gloomy Sunday at the USTA Billie Jean King Tennis Center, unseeded Jack Sock became the first American since Andy Roddick in 2000 to win the boys championship, claiming a 3-6, 6-2, 6-2 victory over Denis Kudla of Arlington, Virginia. At the beginning of the match, many of the 400 or so spectators were probably wondering why Sock had received so much attention during the week. The USTA National junior champion had not lost a set all week, and in his comprehensive 6-3, 6-4 victory over No. 2 seed and Wimbledon boys champion Marton Fucsovics in Saturday's semifinal, he had not faced a break point. But against Kudla, Sock was broken two of the first three times he served, and was frequently looking at his racquet in disbelief, after it produced yet another error. Sock said later that it wasn't nerves, rather just some loose play on his part, plus Kudla's own high level, that led to the 1-5 deficit. Sock began to find his first serve in the next game, and although he was broken to end the set, he seemed to have found the form that had he exhibited throughout the week. Kudla, who had been playing aggressively and even serving and volleying on occasion, made very few errors in the first set, but in the second, with Sock raising his level, the mistakes began to multiply. "He started really neutralizing my attacking ball," said the 18-year-old Kudla, who was playing in his last junior tournament. "I'd come forward on his forehand, and he would hit it high where the only way I'd be able to do something with that is hit it on the rise, which in these kind of conditions isn't the easiest thing to do." Kudla also noticed that he was having more trouble with Sock's serve, and it wasn't just when Sock cracked one of his six aces. "It was big. I'd be able to return it, but it'd be in the middle of the court and he would be able to dictate with his forehand. So I would say his forehand and serve are definitely two shots that gave me a lot of trouble." But it was another Sock shot, just one, that ultimately sealed Kudla's fate. After taking the second set 6-2 and building a 3-1 lead in the third, Sock faced a break point serving at 3-2. Kudla described the point in the press conference. "Yeah, well, I came forward, and I knew he was really far behind the baseline and he hit a great lob. I didn't expect it to be that good. I knew when it was going up chances of it going in were pretty high. I was hoping something would go wrong or it'd go out and I would get a little bit of momentum to hold." "But it's the best shot he could have hit at that moment. If he can do it, then there's nothing I can do about it." Sock went on to hold for 4-2, then break Kudla in the next game. As a light mist began to fall, Kudla may have hoped for the deluge that later cancelled the men's final, but it didn't come. There was no drama as Sock served out the championship--his drop shot and off-speed kick serve produced two points, with errors by Kudla providing the other two necessary to complete the win. Sock dropped his racquet to the baseline and pumped both his fists in the direction of his family members before walking to the net to shake hands. In the lengthy press conference after his victory, Sock was asked how he felt after completing the Kalamazoo-US Open Junior double, the first since Brian Dunn accomplished it in 1992. "I'm very happy, obviously," said Sock, who turns 18 later this month. "It's been a great, great month and a half or two months or whatever, and I'm very happy with the way I'm playing. I mean, Kalamazoo was a great week, as well. I had a rough start, but I was happy with the way I finished there. Then here obviously again I had another good week. I don't know if this is yet settled in much, but I know it's been an unbelievable month and a half. Hopefully I can keep this play up for a while." Kudla was asked about being a part of the first all-American U.S. Open boys doubles final since Roddick beat Robby Ginepri in 2000, and what that meant for their future professional success. "You know, it would be great if we both made it. If you go by that kind of result, looks like his career is gonna be pretty good. You know, it's good to know the last two Americans, they both made it and would be great if we both made it. But since it's my last junior tournament, I'm going to put it behind me. It's done. I finished my junior career with finals at a Grand Slam, which is great. I'll just move forward, keep working on everything. I believe in myself to make it to the top. Hopefully he can do the same." In the all-Russian girls final, top seed Daria Gavrilova defeated Yulia Putintseva 6-3, 6-2. The two friends train at the Moratouraglu Academy in France, and played their first tournament match against each other, but the 16-year-old Gavrilova, Putintseva's senior by one year, demonstrated just how crucial that year's worth of experience can be. After a long battle with American Sloane Stephens in the semifinals, Gavrilova, the recent Youth Olympic Games champion, admitted that her legs were "heavy" for the final and that she didn't sleep well Saturday night. "That was a really bad match, actually," Gavrilova said. "But we were so tired and I couldn't even move." Gavrilova saw her 5-1 first set lead dwindle to 5-3, break point, but Putintseva couldn't capitalize. Gavrilova has too many ways to alter the pace and placement of the ball to allow Putintseva the rhythm and pace she craves, and with Putintseva making unforced errors, her problems were compounded. "My serve was a bit weak, and I did a lot of mistakes, maybe because I was so nervous today," said Putintseva, who left the court in tears prior to the ceremony and didn't return for ten minutes. "It wasn't my best match in this tournament." Putintseva had been able to defeat both No. 2 seed Timea Babos of Hungary and Christina Dinu of Romania this week, an impressive feat considering that those two girls had dealt her five of her 11 losses this year. But in the battle of the 2008 and 2009 Les Petit As champions, it was Gavrilova who held the upper hand. "I was disappointed because I was playing bad, not because I lost or something," Putintseva said. "I didn't show my best today. I was nervous and I couldn't break this feeling today." Gavrilova's goal is now the ITF year-end World Junior top ranking, and she is still planning to play junior slams next year, but her immediate focus is to raise her position on the WTA computers. Asked how she would celebrate her first junior slam championship, Gavrilova, the 2009 French Open girls finalist, revealed just how determined she is to take the next step. "I am traveling tomorrow," she said. "I am flying to California for a $25(K) event." For complete draws, see usopen.org. 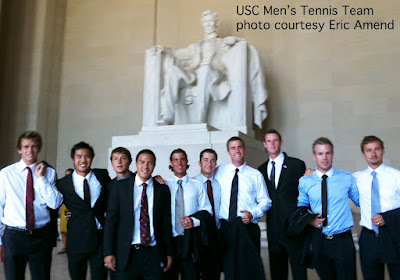 For additional coverage of the U.S. Open junior championships, see collegeandjuniortennis.com.